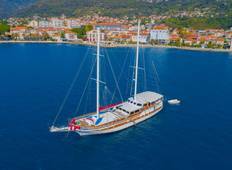 Find a Gulet trip that explores Balkans. There are 16 tours to choose from, that range in length from 4 days up to 14 days. The most popular month for these tours is June, which has the most tour departures. "Fantastic holiday, excellent crew, food and boat. Montenegro is a wonderful country!..." 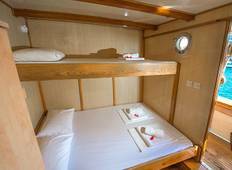 "The care and attention received from all of the crew to ensure a comfortable experience." "The experience of cruising between Islands through the Adriatic Sea was beautiful..."
"I booked for me and my wife a customized tour of Slovenia and after that a long private..."
"I wasn't quite sure what to expect when I signed up for this tour. I was pleasantly..."
"Amazing, loved everything about the tour, croatia, our crew, the meals, and stopping..."
"" Excellent experience with this company, everything was well organized and the customer..."
"I could not recommend this trip more - it was AMAZING! I did Stoke Afloat Croatia..."